The ATI Sunpower Dimmable High Output T5 Pendant is the latest evolution in T5 technology adding full, integrated dimming control to the proven performance of the original Sunpower. 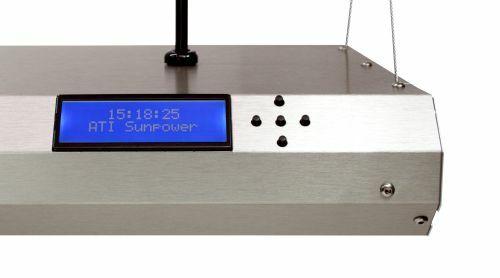 Compared to other lighting systems with dimming control, the ATI Dimmable Sunpower offers an unmatched combination of output and control at an affordable price point. With the built-in controller there is nothing more to buy. Superior design and high-end components produce 50% more light than most other equally-sized T5 fixtures. An active cooling system allows tubes to run at a more optimal temperature, improving both tube output and tube life. The slim, silver colored body is lightweight, durable, rust-proof and just 60mm high. 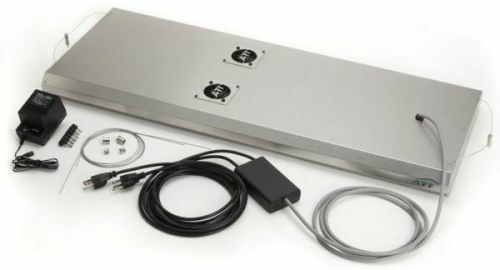 All components including the controller and T5 ballasts are built into the fixture housing with the only item external to the fixture being a single power-cord. ATI have decided to use the most superior reflecting materials on the market today. The Reflector material has a total reflectivity of 98%. Normally polished aluminium reflectors has a reflectivity of 90-95 %. This means a further step in the efficiency increase in ATI T-5 technology of + 5-10%. We are aware of issues in dimming these pendants when 'Low Quality' 'Far Eastern' T5 Tubes are used. The issue is dimming from 0% up to approx 25%. Replacing with ATI or other quality tubes resolves any issues. 8 Tube Units. Circuit 1, Tubes 1 &2 & 4 & 5 & 7 & 8. Circuit 2, Tubes 3 & 6.